ITD has notified revised file formats for preparation of TDS (i.e. Tax Deducted at source) and TCS (i.e. Tax collected at source) statements . Deductors/collectors are required to prepare e-TDS/TCS statements as per these file formats using, NSDL e-Gov. 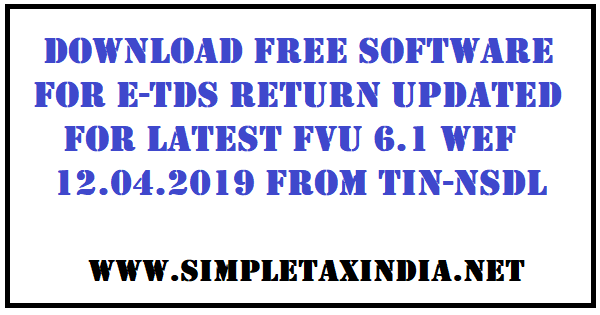 Return Preparation Utility or in-house software or any other third party software and submit the same to any of the TIN-FCs established by NSDL e-Gov. NSDL e-Gov has developed software called e-TDS/TCS Return Preparation Utility (RPU) to facilitate preparation of e-TDS/ TCS returns. This is a freely downloadable VB based utility. Separate utilities are available for preparation of each type of statement. Changes in field level validations for field “Deduction under section 16 (ia)” under Annexure II (Salary Details) of Form 24Q-Q4  In case section ID "16 (ia)" mentioned under field no. 6 of Section16 records (i.e. S16 records as per file format of Form 24Q-Q4), then "Total Deduction under Section 16" should not be allowed to enter value more than `40,000.00. Changes in field level validations for field “Deduction under section 16 (ia)” under Annexure II (Salary Details) of Form 24Q-Q4  In case of section ID 16 (ia), "Total Deduction under Section 16" should be less than or equal to `40,000.00.